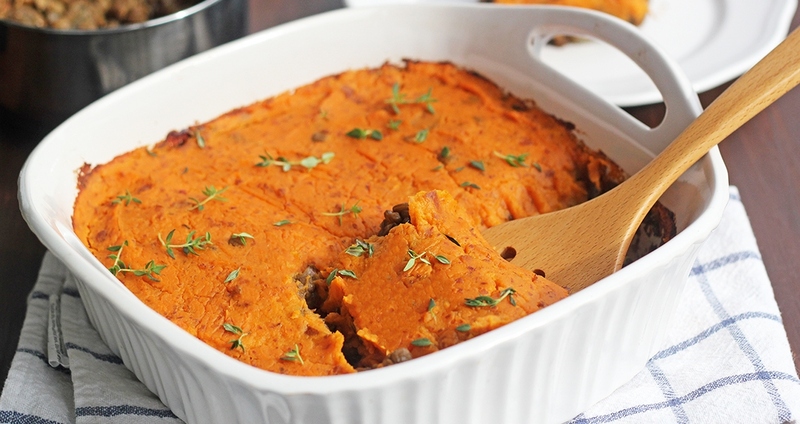 This Vegan Shepherd’s Pie is an unconventional twist on a classic recipe that’s perfect as a one-dish dinner or easy holiday entrée! Since this recipe is both vegan and gluten-free, it works well for a crowd with mixed dietary needs. Serve this with a simple side salad for a complete meal. Add coconut oil to a medium saucepan over medium heat. Add the onions and garlic and sauté for 5 minutes, until onions are fragrant. Add the sea salt, lentils, broth and thyme. Cover pot and bring to a boil, then reduce heat to a simmer. Cook for about 35 minutes, or until lentils are tender. While lentils are cooking, chop the sweet potatoes into quarters and add them to a medium pot over high heat. Add enough water to cover the potatoes. Bring water to a boil, then lower to a simmer. Cook for 15–20 minutes, or until sweet potatoes are tender and can easily be pierced with a fork. Using a slotted spoon, transfer sweet potatoes to a large bowl or food processor. Mash by hand or process vegetables, adding a bit of the cooking liquid if needed, until they reach the desired consistency. Season with salt and pepper to taste. Once lentils are cooked, add the arrowroot powder to the lentil mixture and mix well to thicken. Transfer lentil mixture to an 8" x 8" baking dish. Top with the mashed sweet potatoes. Bake for 20 minutes, until sweet potatoes are slightly browned around the edges. Remove from oven and serve.